Hey all! SO this week I finally got a chance to pursue another piece for my currently titled “PLANTseries”… I need a way better name for it but right now I’m not very inspired. If you have any ideas let me know, haha. I chose to draw the passionflower, an absolutely beautiful flower that grows on a vine and the first time I saw it I could barely believe what I was looking at. They look like they’re from another planet, little alien flowers. Here’s a picture of the stamen… There are so many different variations in color and shapes, they’re incredible. I had a really great time drawing it while watching “Anthony Bourdain: Parts Unknown” on Netflix. It is one of my favorite shows right now and I’m loving all the places he visits. The exotic nature of Myanmar, the incredible food at Noma in Copenhagen and the interesting viewpoint he presents Detroit in. He’s rough, asks uncommon questions and goes to unexpected places. I aspire to be like him because he doesn’t seem to have any prejudices with food and will try anything. I wish I was like that! I mean, I’m still trying to get over the texture of mushrooms… That makes me feel like I have the palette of a five year old. Gotta work on that. 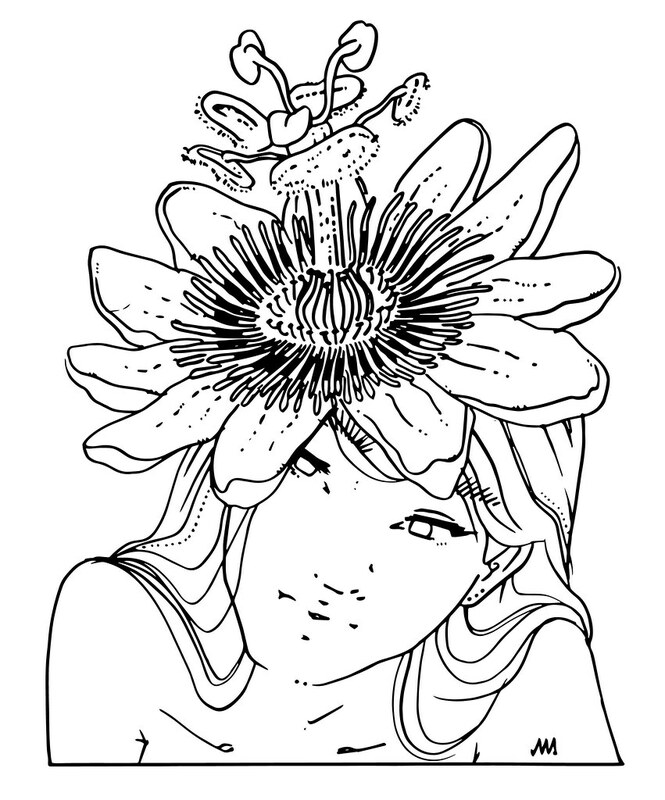 ANYWAYS, working on the passionflower piece was great and once finished with the sketched version I really wanted to go through and do a simple trace and now it’s hard to decide if I like the sketched version or the lined artwork?? What do you think? I have to say I love both but the sketch version looks soft and more detailed!